In the United Kingdom (UK), animal testing is strictly regulated. This is due, in part, to the increase in public concern over animal testing during the latter half of the twentieth century as well as the government's own commitment and care to protecting animals and ensuring their use is ethical and humane. We are actually fortunate that our system is one of the most - if not the most - stringent in the world. The Animals Act - or Scientific Procedures Act - was passed in 1986 and applies to animal testing in the UK. It enforces the general premise or idea that an experiment must be governed by three different licenses. The first is a project license for the head researcher who oversees the experimentation. This license will provide the specifics of how many animals will be used as well as which types of animals are to be used in the experiment. It also details the experiment itself and its aims. The second license involves certification for the agency, which serves to confirm that it has appropriate facilities and that it is sufficiently staffed to handle the experiment and the animal testing. The third license is a personal license for every single researcher or technician who will be involved in fulfilling the procedural requirements. The requirements for a project license are extremely strict because they serve to ensure that those who conduct animal testing are accountable and responsible for their actions. It also serves to ensure that testing is transparent and that all aspects of the intended research are clearly laid out and documented. When the Home Office is considering an application for a license, it utilises a cost-benefit approach, which assesses the potential negative effects on the animals in comparison with the perceived benefit from the experiment. A license is only granted if the benefit outweighs the potential negative effects to the animal. The Home Office will also not grant a license for animal use if there is another alternative that can quite effectively satisfy the experimental aims. Experiments are required to use the absolute minimum number of animals necessary to effectively conduct the research. Researchers must also use those animals that have the absolute lowest level of sensitivity to pain and experiments must also minimise the level of pain that can occur. This may mean using pain relievers or anaesthetic where necessary to reduce suffering and distress. All of these aspects are weighed when considering the granting of a project license. In fact, the UK is the only country that assesses every single license application with a high level of scrutiny while also conducting a cost-benefit analysis. In addition, trained and qualified inspectors monitor animal testing facilities both on-site and off-site to ensure compliance with UK laws. Despite the detailed requirements for project license application and approval in the UK, there are still criticisms of the current system of approval for animal testing. Opponents argue that the Home Office is too quick to approve an experiment and that it grants project licenses without adequate scrutiny to the experimental procedure and the animals used. Critics also complain that researchers who are presenting their case may perform the cost-benefit assessments rather than the Home Office itself. Animal testing laws and regulations will continue to provide monitoring, assessment and consequences for the animal testing industry. This trend will likely continue and if anything, it is anticipated that laws will strengthen as the government faces new challenges in the regulation of animal testing, particularly with the advent of outsourcing to countries where regulations are weak or non-existent. The final goal is to use local laws to allow us to improve medicine and knowledge while simultaneously respecting animals and treating them with respect. What we r doing to animals is bad. But what alternatives do w have? Why is vivisection such secret activity hidden from public view? 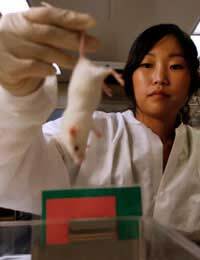 Why not tell students, at the universities where it takes place, about it.Many medicines never make it to the market because they fail animal test. This does not mean they would be unsuitable for humans.Animal tests determine if a medicine is safe to use with 30% certainty. It would be more accurate to flip a coin! someone comments if it wasn't for animal testing we would all be dead. I'm sure in the day and age we are living in, scientists can find a better way to cure diseases than abusing and killing gods creatures. Like herbs and the natural things that grow on earth that is a more natural and likely to work, or even better, they could experiment on the idiot that don't give a dam about living creatures suffering in labs. @Linds. Here is an article about the Animal testing in the USA which you may find interesting. i was wondering if there is a law in the USA that says animal testing for companys is illigal?????????????????? ?